It may be week two in Major League Lacrosse but Ben Rubeor is in mid season form. The seven year pro out of University of Virginia tallied five goals as Chesapeake hosted Florida for a Sunday afternoon matinee, in front of a crowd over 4,000 patrons. After trading goals in the early going, the Bayhawks took a one goal advantage into half at 5-4, but it was Chesapeake that came out firing in the second half scoring the games next three goals. In a 10-6 game Launch goalie, Brett Queener cleared the midfield line on a clear, then ran a simple give and go as the goalie was overlooked as an offensive threat. Queener buried it to draw the launch closer with a lot of momentum, but the Bayhawks and Rubeor responded, putting the game out of reach. Launch attackman Kieran McArdle netted four goals in the Launch opener, but it wouldn’t be enough. The Bayhawks really did beat the Launch in every facet of the game, Queener kept them in it with 26 saves. 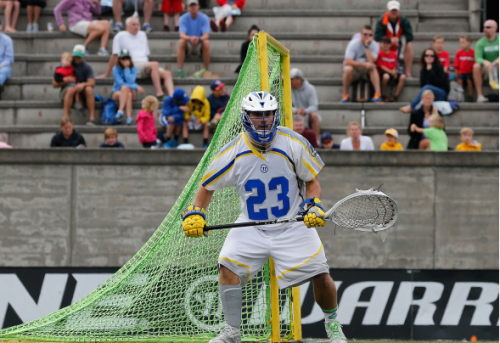 Tyler Fiorito recorded 18 saves for the Bayhawks.